Uncle Harry needs a cheap band for a sweet-sixteen party of a client, so he hires Craig's band featuring Kim as the vocalist. All goes well until Kim comes home with laryngitis from a day of surfing. Lucy decides to take Kim's place, by wearing a miniskirt and mod wig. Special Notes: Lucille's singing voice is dubbed by Carole Cook. Lucie nor Lucille were trusted to perform musically at this point. This is the first and only appearance of Doris Singleton as Harry's competent and efficient secretary Miss Singleton. 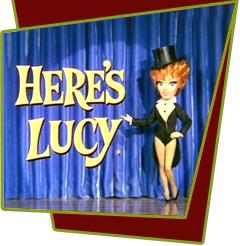 Originally intended to be a series regular, the character was dropped as it was decided to show more of Lucy's family life with the kids rather than her job.